Kenny's Tile services Lenexa, KS for your home remodeling needs. We offer professional installation, replacement and repair of tile, stone and hardwood floors in the Lenexa area. 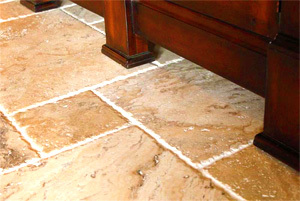 We carry the finest ceramic, granite and travertine tile products available. Our expert team will install fine quality carpet in your home, remodel your kitchen with new countertops, or design a new bathroom complete with all new fixtures. Our company offers free home inspection, a no-obligation quote on all appliances and labor, and we back our work with a satisfaction guarantee. A representative from Kenny's Tile will come to your home, sit down with you and discuss your flooring needs. We provide samples of all the ceramic and stone tiles in our inventory and will be happy to provide an estimate. We also specialize in unfinished and pre-finished hardwood floor products, and we carry a full line of oak, ash, hickory and walnut flooring. Our customers can choose unfinished wood and order their choice of stain or varnish, creating a custom look that becomes a wonderful investment in their Lenexa home. Good quality tile or hardwood floors greatly increase the value of the property, last a lifetime and require very little maintenance. Our GraniteWorks division imports the finest quality granite, marble and travertine from Europe and South America. New granite or marble countertops are more affordable than most folks realize, and they help to create an exciting atmosphere in the kitchen. We also perform expert repair of broken marble and granite surfaces, accurately matching new product to the correct shade, marbling and texture of the existing stone. Kenny's Tile has some of the best hardwood floor refinishing experts in the industry. We use a dustless refinishing system that helps to keep the mess away when refinishing your hardwood floors. Newly refinished floors add a certain amount of luxury and value back into your Lenexa home. We can meet you in your home and provide a free estimate to refinish your hardwood floors. We even have a showroom available to see the different colors of hardwood floor stains available to suit every decor. Nothing says elegance more than beautiful hardwood stairs. We offer our Lenexa customers the choice of hundreds of designs including staircases with balusters, newel posts, volute handrail fittings and hand hewn spindles. All of the installations are completed by Kenny's Tile employees, with no subcontracting involved. This saves our customers money and allows them to discuss installation options directly with those performing the work. Our staircases are guaranteed to outlast the home itself. Although our name says tile, we are also expert bathroom fixture and appliance installers. We offer some of the finest name brand bathtubs on the market at lower than retail price. We carry a large selection of whirlpool and massage tubs, and we invite the public to visit our showroom that features our full Carver bathtub line. Our bathtubs and sink products are eco-friendly and save our customers money on water and heating bills. We will help you or your contractor choose the perfect bath products for your Lenexa home. Whether you need to install carpet, countertops, hardwood flooring or a new stair rail, Kenny's Tile is the company to contact. Our reputation has been built around our history of customer satisfaction, and our repair service is prompt and reliable. If you are dreaming of a new look to your Lenexa home, come by our showroom and let our representatives show you how affordable remodeling can be.